This unique West Indian Style cottage was built 10 years ago amidst a grove of tropical trees 950 feet above sea level on the slopes of Nevis Peak. 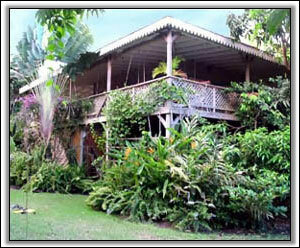 The house is elevated, has a view of the ocean and large wrap around gallery which is festooned with jasmine, petria, bougainvillea, mangos and limes. Below is a mature tropical garden where monkeys visit and hummingbirds abound. This is a truly peaceful spot cooled by the ever present trade winds. Five minutes stroll up the hill is the charming Golden Rock Plantation Inn which is open to our guests for breakfast, lunch or dinner or just a drink at the bar. Our residents may also swim in their wonderful spring-fed pool with far reaching views to Antigua. The most popular walk up the mountain is "The Source"- actually commencing a moment's walk from Tree tops. Indian Castle beach is located just 10 minutes away by car. The house is fully furnished and has mixed hardwood planked floors. 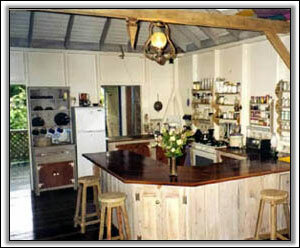 There is a large open plan style kitchen and plenty of seating inside and out. Two couches in the main room double as small single beds suitable for children or small adults. 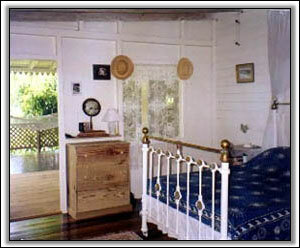 The bedroom has an antique iron double bed with net and access to a large bathroom. 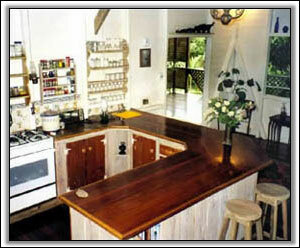 Fully equipped kitchen with 8 place settings. 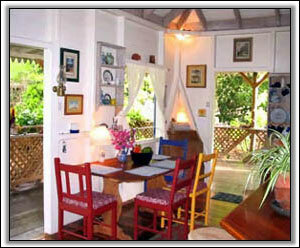 Nestled in the corner of the garden of Tree tops is Christmas Cottage, a small Caribbean style cottage. 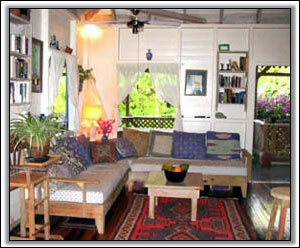 Although small, it has a double bedroom and single couch/bed in the living area. There is a picnic table on the front porch and toilet with shower.